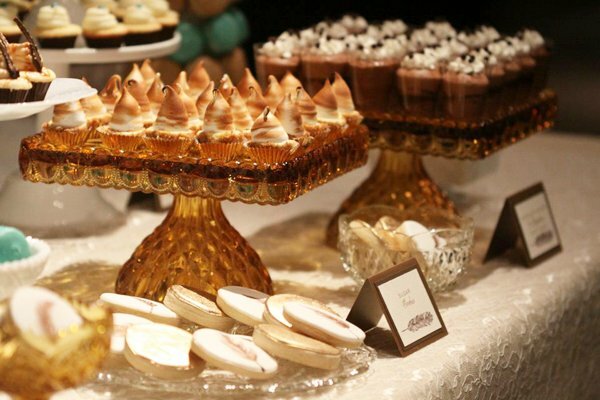 Is this dessert table GORGEOUS or what?! 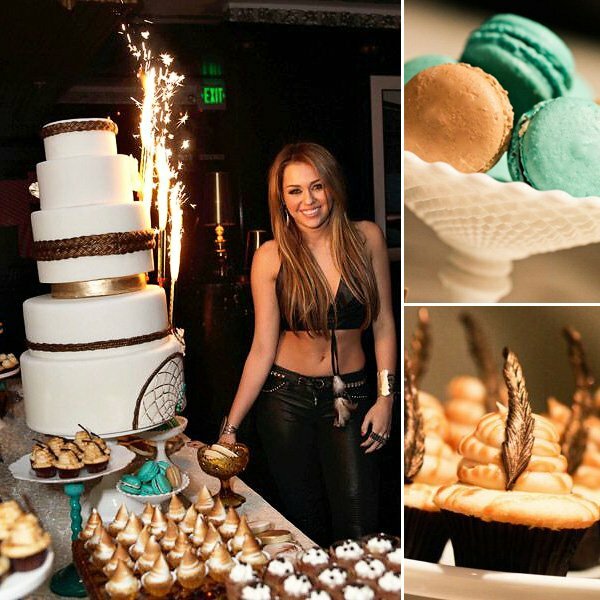 Melody from Sweet and Saucy Shop created this amazing spread for Miley Cyrus’ 18th birthday party this past weekend. 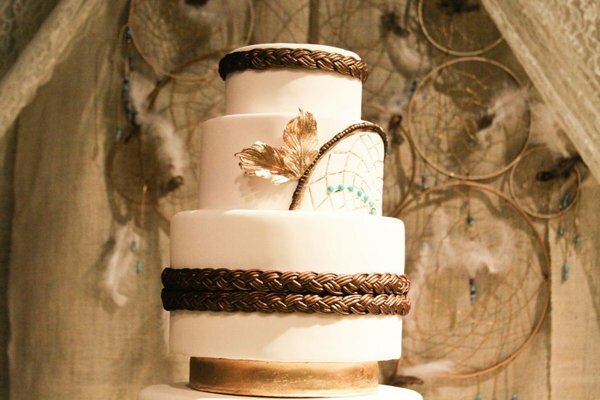 In addition to the stunning birthday cake – which included shimmery, whimsical details like hand-carved dream catchers, sugar feathers, and sugar turquoise beads – the table featured over 500 desserts! 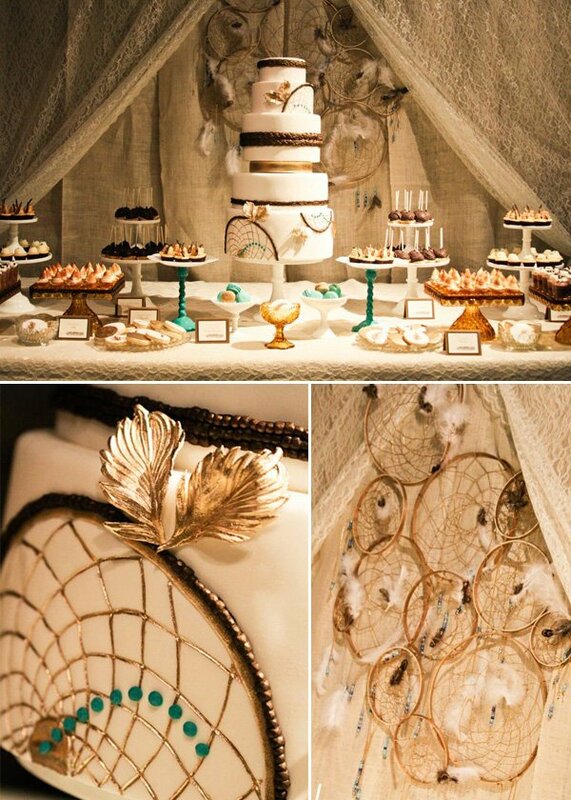 Melody was told that Miley loves dream catchers and bohemian style, so the dessert table was designed with those interests in mind & came together beautifully! 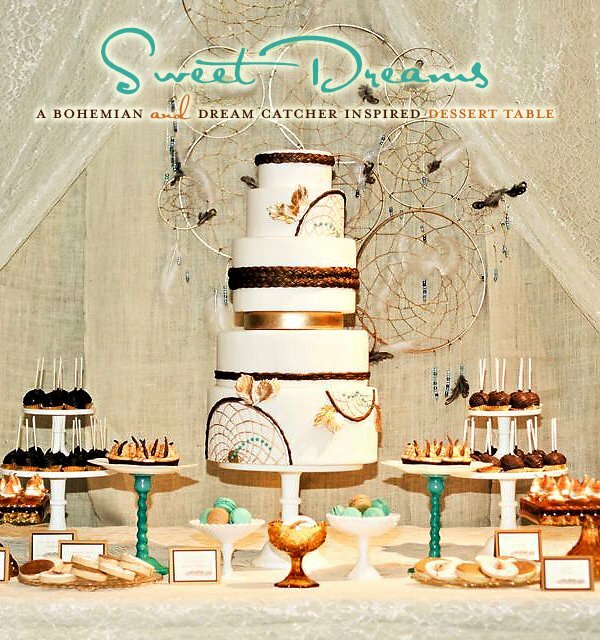 Huge kudos also go to Jesi from Jesi Haack Weddings for creating the amazing dream catcher backdrop, and to Elizabeth and Karrie from Posh Paperie for the perfectly coordinating dessert cards. P.S. 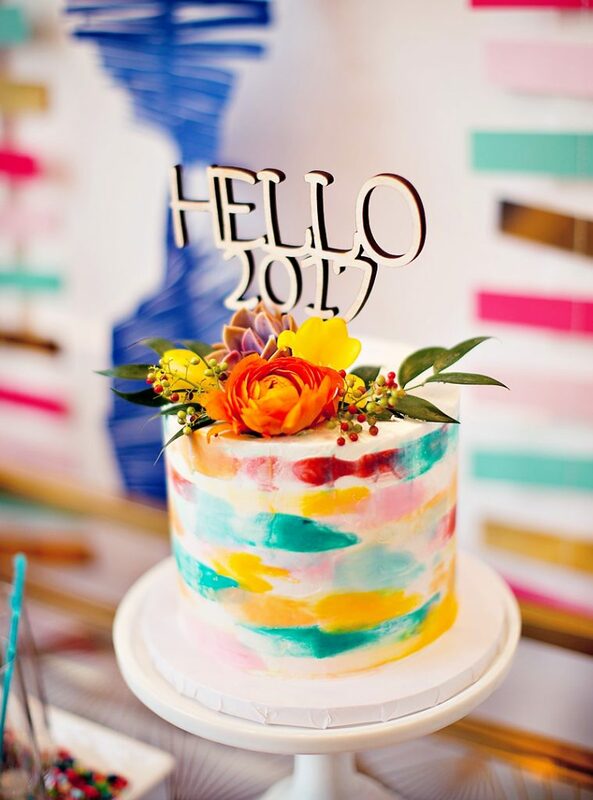 I’m also filing this under New Year’s Eve because – between the color palette, the festive metallics, and the “dream catcher” element – don’t you think this would be a fantastic theme for a New Year’s party?! 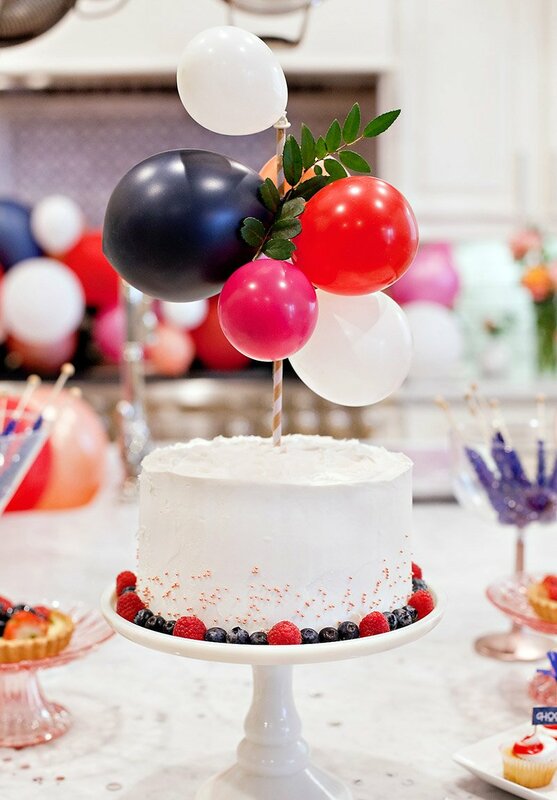 Melody’s mom (who also happens to be the co-owner of Sweet and Saucy) made these fabulous Red Velvet and Vanilla cake pops and dusted some with golden shimmer! Stunning event! Probably one of the most beautiful and stylish I’ve seen so far. Melody did an incredible job with the whole table, especially the cake! This is a lovely tablescape the colors are so creamy … it has somewhat of a vintage feel to it. 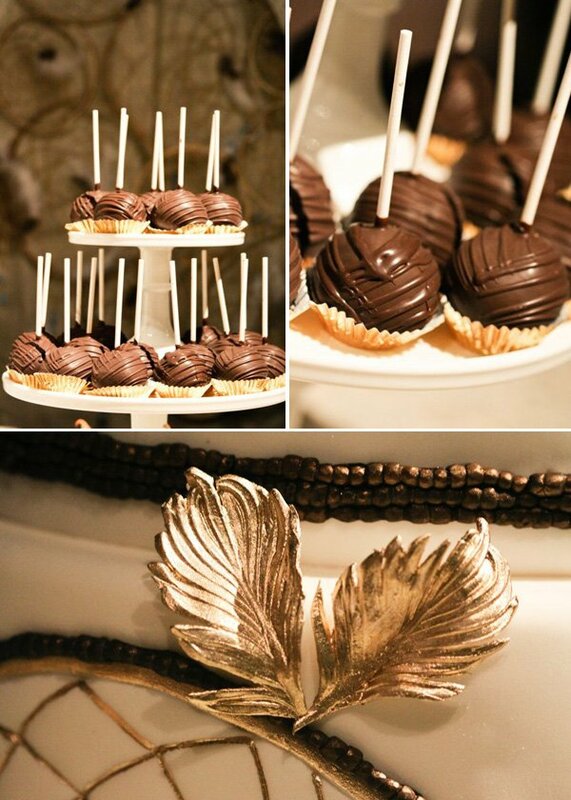 Absolutely gorgeous dessert table! 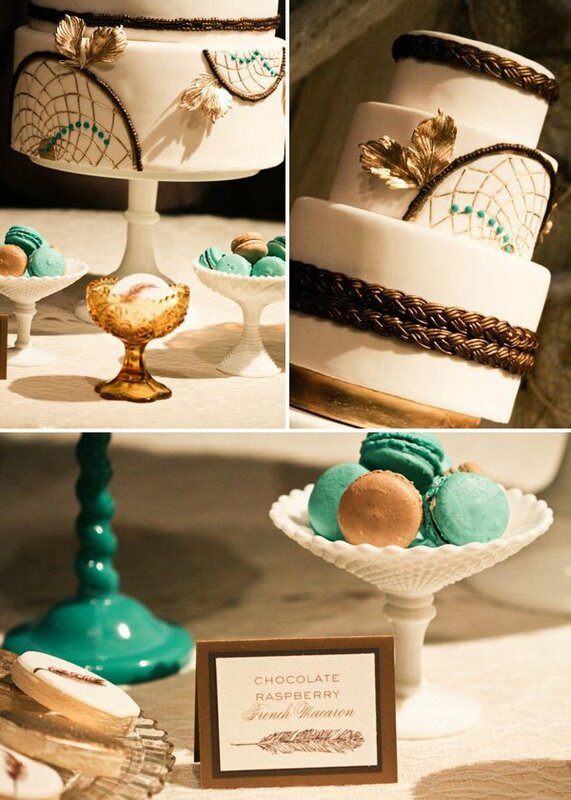 Loving the color combinations, the details on the cake, and the cake stands are beautiful! Happy 18th Birthday Miley! 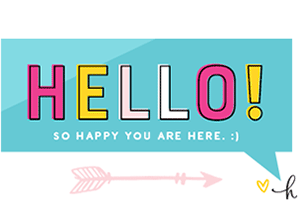 You look great! 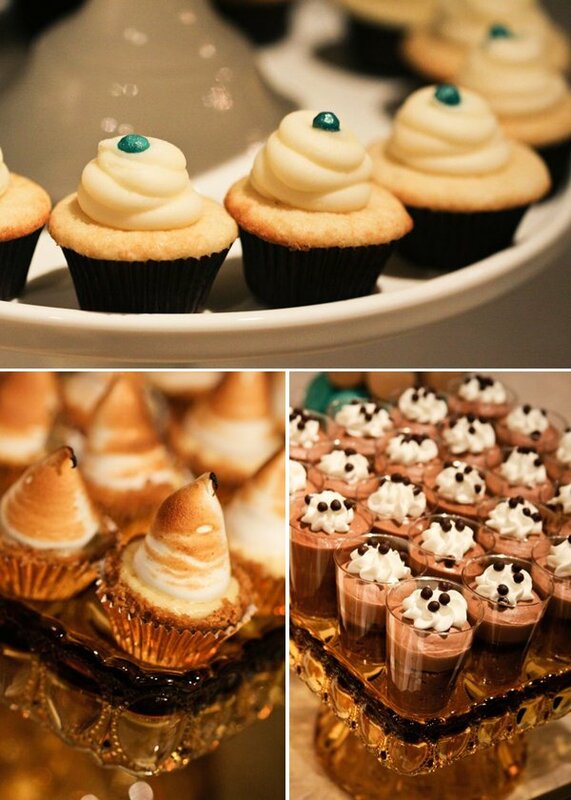 This dessert buffet is amazing!! 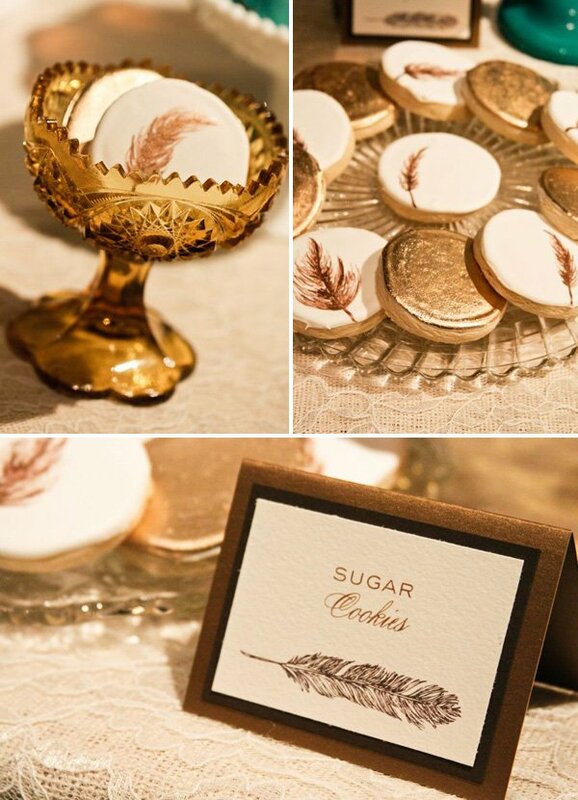 I LOVE the gold feathers and dream catchers! Beautiful pictures but seriously did Miley have to dress like that!!!!! That’s what I thought. Such beautiful work. Miley disappointed me with that outfit next to it! And I like Miley and not so critical of her like most of the world. The decorations look beautiful but why do people have to criticize Miley’s style – its more like the real her than the Hannah Montana style. 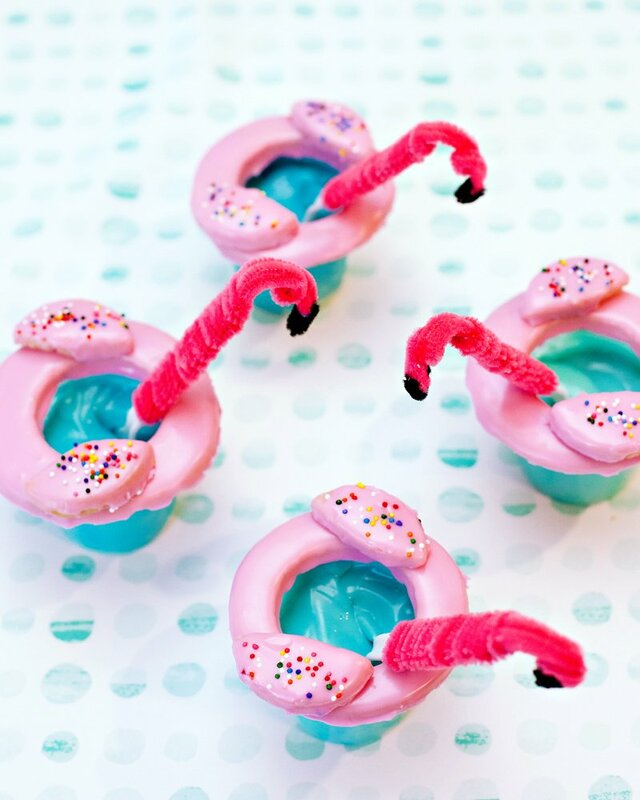 That is a BEAUTIFUL party, and it’s making me hungry for dessert! Very well done. Only Joan Jett can wear a leather bikini with leather pants and no shoes at Vans Warped Tour and she’s coming up on 50! So apparently wearing a leather bikini is appropriate for your 18th birthday party? Lovely! 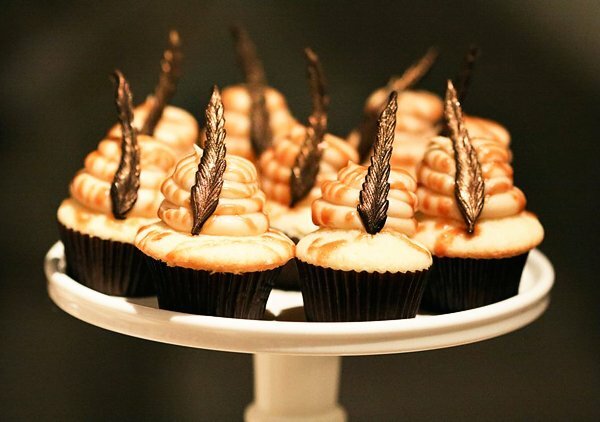 And those cake stands are to die for! c’mon peeps! let the girl wear whatever she wants on her birthday!! wish I can go back to that age!! 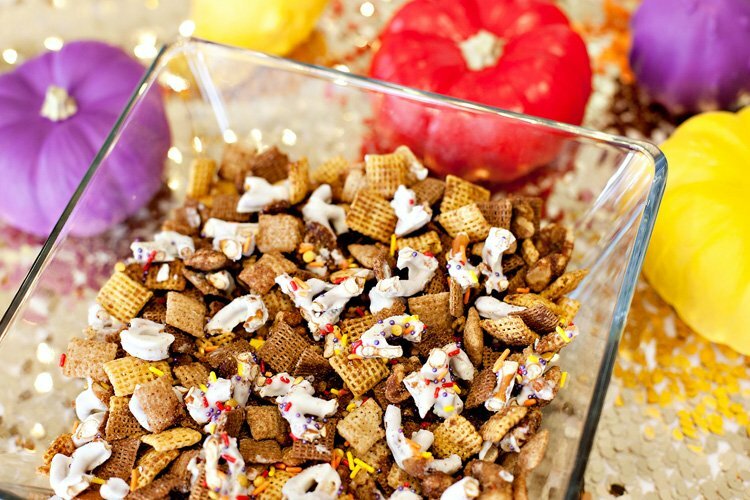 GREAT job to Jasi Haack, Sweet & Saucy & Posh Paperie for such an eye candy dessert table!! Awesome team work!! I love Miley, and I am so honored to have played a part in her birthday! 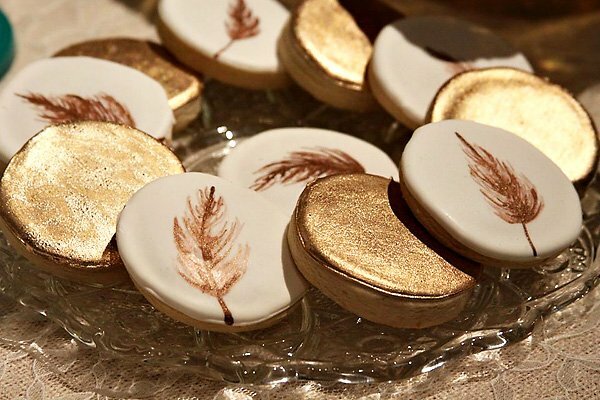 Thanks, Jenn, for the beautiful feature! And thank you all, for the sweet comments! But that outfit of her at her 18th Birthday… tacky. This is gorgeous!! All of the details are stunning. I really like the gold touches! This table looks great! 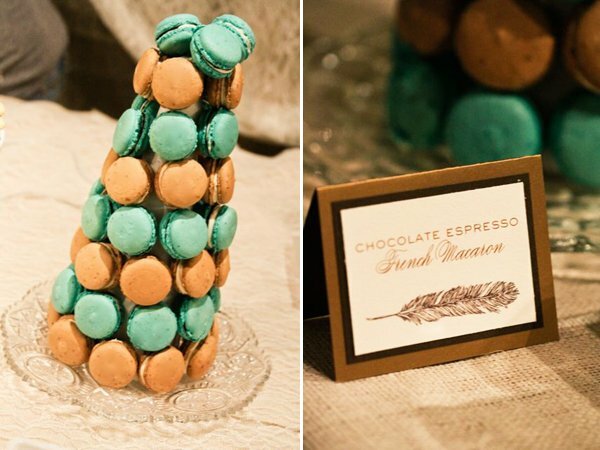 I love the color pallette and the cake is amazing! I didn’t know this was posted to blast Miley’s decision on her clothes. It sounds to me like a bunch of old hags who wish they had her body. She is 18 and beautiful. Now if she had a muffin top and wearing this particular outfit then I can see someone point it out. People need to stop criticizing and judging other people and lead happy lives. We don’t need more negativity in this world. To be honest people put these Disney stars on pedestals of grandeur and angel wings who could do no wrong. Guess what people? They are HUMAN! who have a personality. Stop destroying them with your comments. The same thing you are all doing to her as to Britney. Let them be. Your comments are hurtful. Like the saying goes if you got nothing nice to say then say nothing at all. Wow! Amazing! 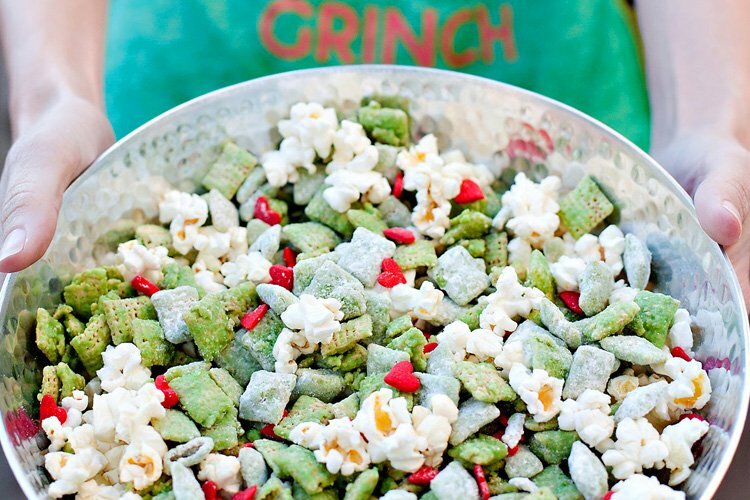 The theme reminds me on the surprise basket on “Chopped”–you know some crazy ingredients that you have to turn into a gourmet meal. 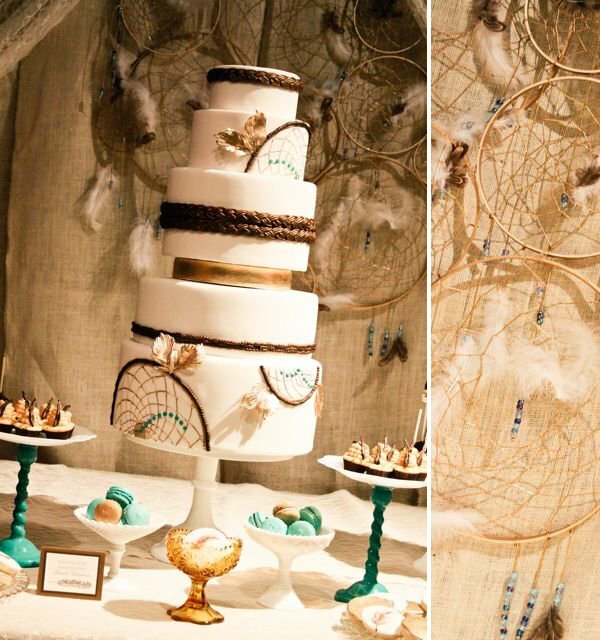 I wouldn’t even know where to begin with dream catchers and feathers. However, you pulled it off. It is quite elegant.